August 2, 1939: Albert Einstein sends a letter to President Roosevelt describing the feasibility of atomic power, the potential use of atomic bombs, and a warning that Germany is already working on atomic research. March 28, 1941: American scientists conclude that plutonium can be used as a weapon. December 6, 1941: President Roosevelt authorizes the Manhattan Project to develop atomic weapons. December 7, 1941: Japanese forces attack the Unites States Naval base at Pearl Harbor, Hawaii, thus bringing the United States into World War Two. December 2, 1942: Enrico Fermi and his team at the University of Chicago produce the world’s first controlled and sustained nuclear fission reaction. March, 1943: Construction begins on The Hanford Site, in Washington State. 1944: A second uranium reactor is built at Clinton, Tennessee for manufacturing plutonium for an atomic bomb. (The first reactor was Fermi’s experiment in Chicago). November, 1944: The first batch of plutonium from Hanford's reactors is ready for testing. January, 1945: Weaponizaton of plutonium begins at Hanford with the reprocessing of th plutonium. January 20, 1945: The first batch of Uranium-235 is successfully separated at Oak Ridge National Laboratory in Tennessee. April 12, 1945: President Franklin D. Roosevelt dies. His Vice-President, Harry S Truman, becomes the 33rd President of the United States. As Roosevelt had never bothered to inform Truman of the Manhattan Project or anything about the atomic bomb program, Truman spent his first couple of weeks as President completely unaware of the atom bombs currently in development. April 24, 1945: Secretary of War Harry Stimson and General Leslie Groves (who was the general in charge of the Manhattan Project), brief President Truman on the full scope of the atomic research and development and the plans for the atomic bombs. April 27, 1945: The Target Committee meets for the first time in order to decide which Japanese cities to target with the atomic bomb. May 8, 1945: Germany surrenders to the Allies, ending the war in Europe. June 22, 1945: The Battle of Okinawa ended after 82 bloody days. Okinawa is an island (part of Japan itself), and the Japanese military and the civilian population on the island fought ferociously. Allied casualties (dead, wounded, and missing), equalled 82,000. Over 360 Allied ships were damaged in the battle, largely due to the suicide Kamikaze plane attacks, while 768 U.S. warplanes were lost. Most of the Japanese defenders literally fought to the death, and even most of the civilian population chose to die rather than surrender. The heavy Allied casualties, combined with the ferocity shown by the Japanese in defending home territiory, was a major consideration in President Truman's decision to use the atomic bombs. Plans were already underway for an Allied invasion of the main Japanese Home Islands, and based on the defense of Okinawa, estimates of Allied casualties ranged from 250,000 to nearly a million. It was known that the Japanese were preparing to defend the Home Islands, and that millions of civilians were being trained to fight as well. July 16, 1945: The Trinity test explosion of the world’s first atomic bomb occurred at Alamogordo, New Mexico. The bomb exploded with force equivalent to fifteen thousand tons of dynamite, and the flash of light could be seen over 200 miles away. The test explosion was more powerful than expected by the scientists and military personnel working in the Manhattan Project. July, 16, 1945: The USS Indianapolis, a U.S. Navy Heavy Cruiser, departed San Francisco, carrying parts and the enriched uranium (about half of the world's supply of Uranium-235 at the time) for the Little Boy atomic bomb with orders to deliver the cargo to the Pacific island of Tinian. July 21, 1945: Truman, who was in Potsdam, Germany at a conference with the leaders of Britain and the Soviet Union, receives his first full report on the Trinity Test. Over the course of the next couple of weeks, Truman would meet with Generals Marshall and Eisenhower, as well as with British Prime Minister Winston Churchill regarding this new weapon. July 26, 1945: The Potsdam Declaration, calling for the unconditional surrender of Japan, is issued by the United States, Britain, and China. 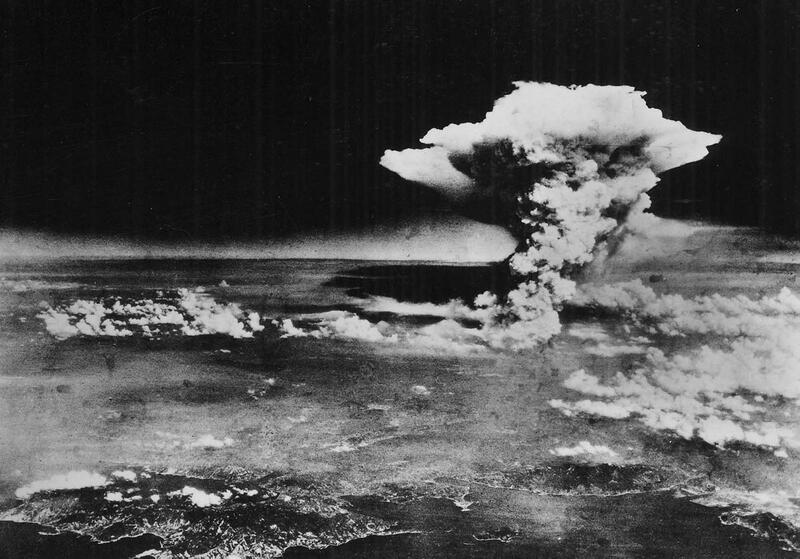 While not specifying that the U.S. now had atomic weapons, the Declaration asserted that unless Japan surrendered, it would face "prompt and utter destruction.” The Japanese government chose to respond with silence. July 26, 1945: The USS Indianapolis, a U.S. Navy Heavy Cruiser, arrived at the island of Tinian. July 30, 1945: After delivering the atomic cargo to Tinian, The USS Indianapolis was returning to the U.S., when it was struck by a torpedo fired by the Imperial Japanese Navy submarine I-58, sinking in 12 minutes. Of 1,196 crewmen aboard the Indianapolis, approximately 300 went down with the ship. The 900 crewmen who survived the sinking faced exposure, dehydration, saltwater poisoning, and shark attacks while floating in the ocean with few lifeboats and almost no food or water. The Navy learned of the sinking when survivors were spotted four days later by the crew of a patrol plane. Only 317 of the sailors survived. This attack resulted in the greatest single loss of life at sea in the history of the U.S. Navy. 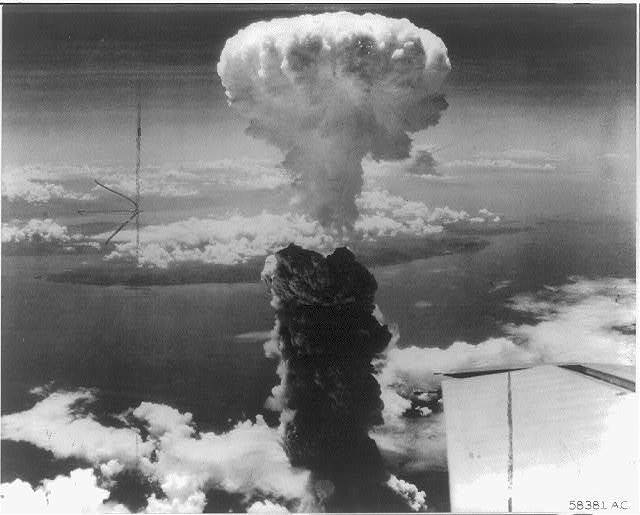 August 6, 1945: The Enola Gay, a B-29 Superfortress bomber based on the Pacific island of Tinian, and commanded by Colonel Paul Tibbets, drops a 15 kiloton atomic bomb nicknamed Little Boy over the Japanese city of Hiroshima. Approximatley 130,000 people died in the explosion and the immediate after-effects of the attack. August 9, 1945: Per earlier agreements between Stalin, Churchill, and Roosevelt at Yalta, the Soviet Union declared war on Japan and launched a massive invasion of Japanese-held China (the Manchuria region), northern Korea, Sakhalin Island, and the Kurile Islands. August 9, 1945: Bockscar, a B-29 Superfortress commanded by Major Charles Sweeney, dropped a 21 kiloton atomic bomb on the Japanese city of Nagasaki. The original target was the city of Kokura, but bad weather and the smoke from massive bombing raid from the day before, obscured the target area, forcing Bockscar to divert to the secondary target of Nagasaki.Roughly 60,000-70,000 died in this atomic attack. August 10, 1945: Japanese Emperor Hirohito decides that Japan must accept the Potsdam Declaration and surrender. August 14-15, 1945: Attempted coup in Japan with the intention of continuing the war. The coup attempt took place the night before Japan was to announce the surrender. The coup failed, and Japan announced acceptance of the Potsdam Declaration and their surrender to the Allies. August 15, 1945: In a recorded radio address, Emperor Hirohito announced to his people and to the world that Japan would surrender to the Allies. September 2, 1945: Aboard the USS Missouri, an American battleship in Tokyo Bay, representatives of the Japanese government signed the official documents of surrender. World War Two thus ended.